It’s the new frontier of parenting: screen time and its effect on our kids. How do we set guidelines when the technology is still so new? How do we set boundaries that are both reasonable and age-appropriate? And how do we handle our kids’ questions and comparisons to what their friends are allowed to do? Luckily, though still a very new area, a great deal of research is starting to reveal insights that are useful to parents — not only for setting screen time ground rules for our kids, but for ourselves as well. Technology isn’t all good, but it’s also not all evil, as some parents have been warned. While kids still need to spend plenty of time reading and playing actively and outdoors, there is still value to be found in some screen time. That’s especially true when it comes to enjoying shared screen time experiences. 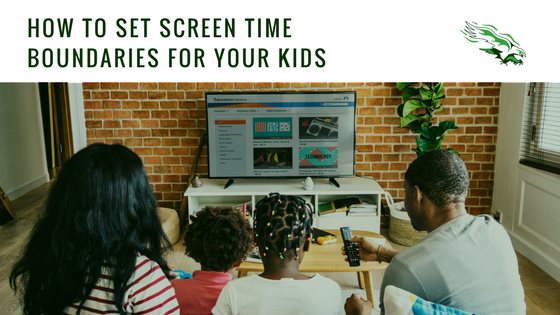 Dr. Jenny Radesky, a research pediatrician and the lead author of the AAP’s most recent guidelines on media and children, emphasizes joint screen time as a key point in both her research and her home life. The rule she’s set for her own two children is no media during the week, but on Friday, they enjoy a movie night as a family. Sitting down to enjoy a movie or a tv episode together as a family is an excellent way to relax together, but can also open up a discussion about the story — or even inspire fits of giggles. Who doesn’t love to laugh together as a family? For children under 18 months, the guidelines emphasize a strict, no media or screens policy, with the exception of FaceTime calls. Why? These calls are interactive and promote one-on-one bonding with your baby or toddler. For anyone who’s ever stayed up far too late, lured in by the siren call of their phone, tablet, computer, or tv screen, you know it’s true: screens tell our brains to stay awake. Research has shown that screen time in the hours before bed not only reduces our time asleep, but the quality of our sleep as well. A good boundary to set as a family is to keep tv’s out of the bedroom, charge phones, tablets, and laptops away from the side of your bed, and turn off all screens an hour before bedtime in order to give your brains time to unwind. TV is experiencing a “golden age of storytelling,” movies are wonderful ways to learn something new, and plenty of video games inspire both fun and problem-solving. So it’s also key to pay attention to the quality of the screen time, as well as the time allowed for screen time. Douglas Gentile, an Iowa State professor and expert on media and violence, watched and tried everything out himself before handing it over to his two daughters. Anya Kamenitz, digital education reporter for NPR and author of the book “The Art of Screen Time,” recommends that parents acknowledge technology as part of modern lifestyles and parenting. It’s unavoidable at this point, so she suggests that parents find a healthy way to incorporate technology at home. Part of that is appreciating the way we use technology to learn about the world and connect with others, she says. She also likes the way it “turns the tables,” turning your kids into teachers and you, the students. It’s nearly impossible to tell your kids not to do something when you’re modeling that same behavior. What’s more is, kids notice when we’re detached from them or distracted because of technology. “We are creating the environment our kids are growing up in,” Kamenitz says. So when it comes to setting boundaries, it’s healthier and more effective to set boundaries as a family.